Ardex Feather Finish Smoothing Compound is an ultra-rapid drying sub-floor smoothing compound, and provides a high bond to concrete, plywood, cement/sand screeds, existing sub-floor smoothing compounds and even existing ceramic tiles without the use of primers. 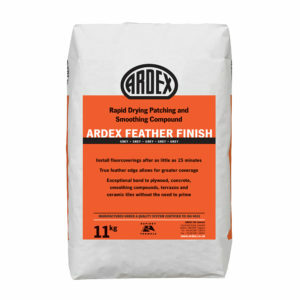 Ardex Feather Finish comes in 5kg or 11kg bags. 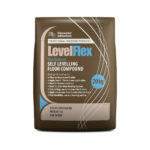 Ardex Feather Finish is ideal for patching and smoothing minor surface damage to levelling and smoothing compounds. 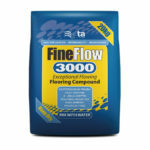 It can also be used for patching, filling and feather finishing to daywork joints, ridges, gouges, depressions and uneven trowel marks in the sub-floor, as well as smoothing joints between staggered plywood sheets. Ardex Feather Finish is designed for use in commercial and domestic locations where the installation involves the use of resilient sheet or floorcoverings such as vinyl sheet or tiles and carpet. Ardex Feather Finish is easily applied with a steel trowel and can be used to form a true feather edge up to 3mm in thickness. Ardex Feather Finish is designed specifically for very thin smoothing applications typically 1mm thick or less, but may be used up to 3mm thick in one application. For thicknesses of 3mm (not exceeding 12mm) it is recommended to build up in thin applications or alternatively consult the Ardex ARDURAPID A 45 data sheet. When applying Ardex Feather Finish to wooden floors the maximum total depth is 3mm. 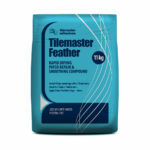 Providing the layer has hardened sufficiently and the adhesive trowel does not damage the mortar surface, the floorcovering may be installed, even if the surface appears to be damp. A skim coat may be sufficiently hard enough after 15 minutes but obviously will depend on the absorbency of the sub-floor and site temperatures. Thicker applications will require additional drying time. NOTE: Select a flooring adhesive that is compatible with the sub-floor beneath the Ardex Feather Finish, otherwise a 3mm smoothing layer will be necessary. Apply at temperatures above 50C. Approximately 15 minutes at 20°C. NOTE: The pot life will vary with ambient conditions – lower temperatures will extend and higher temperatures will shorten the pot life and drying time. 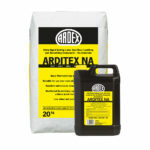 Be sure to mix only the amount of Ardex Feather Finish you can use within the pot life and no more. DO NOT add additional water. An 11kg bag of Ardex Feather Finish, when used to smooth a plywood sub-floor, will give up to approximately 50m2 of coverage when a skim coat is applied. Thicker applications will reduce coverage, e.g. 10m² at a 1mm thickness. A 5kg bag will cover 4.5m² at 1mm thick, or approximately 22.5m² as a scratch coat.